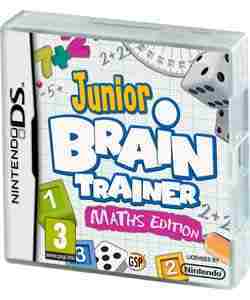 We've enlisted the help of the Family Panel's older child contingent for our latest review, Junior Brain Trainer Maths Edition for DS, by Avanquest. So, did it satisfy the keen gamers? Games consoles can be the plague of parents everywhere- plug one in, or even switch on one of the portable versions, like the DS, and chances are the kids will forget their homework until the morning before school starts! Now, Avanquest have produced games which not only keep the kids appetite for game play satisfied, they are sneakily educational too, so a happy medium can be achieved. The Junior Brain Trainer, Maths edition we tried is aimed at kids over 7, and was enthusiastically received by the tweens who tried it. Just like normal games, the Maths Edition game has strategy game play, and is sold to the child as an adventure, where every part they manage to work out will lead to the next level. Of course, they have to work out maths puzzles suited to their age range, helping build confidence in maths without the boredom of sitting and working out puzzles in a text book. I like how it keys into the new age of games and consoles being all important to children as soon as they are old enough to work the buttons on the keypad. That they are learning basic maths skills in a colourful and fun way is why I would be happy to allow my children to use a console when they are older. The tweens who tried it seemed to really enjoy it, taking time to work out each maths problem carefully, and it was encouraging to see one tween who isn't so confident and usually tries to get out of any maths homework or tuition happily playing this. Its also great to build not just maths skills but reading and problem solving skills too, again in a fun way. With 3 levels of difficulty, and the challenge within the levels to find different parts to complete each difficulty level, it's a game which grows with the child- once they complete and are confident in one level of difficulty, they can continue to improve by upping the difficulty level. Its also designed to compliment the child's school based education, with puzzles to suit the key stages. At under £20, this is well worth investing in to improve not just a child's basic maths skills, but that of us adults too- it certainly helped my rather dusty and never that great numeracy knowledge too. A great game, well thought out- there are others in the range too.